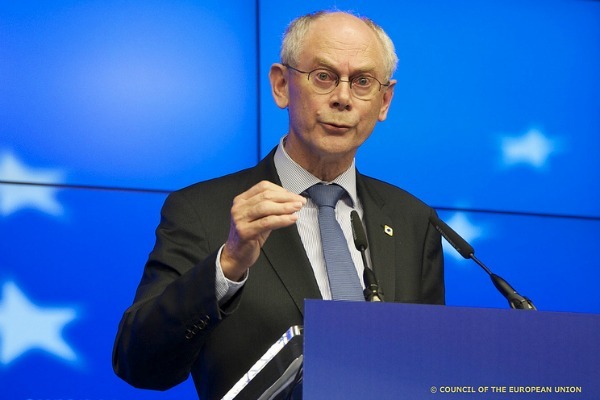 Having public candidates for the Commission presidency during the next EU elections is not the panacea for Europe’s credibility woes, says European Council President Herman Van Rompuy. While European parties look for figureheads for their EU election campaigns, the president of the European Council feels this will not resolve Europe’s democratic deficit. “You don’t have to look for solutions to things that aren’t a problem. To go and look for ‘faces’ to guide the EU: that’s not a solution,” Van Rompuy said at a debate last Thursday (10 October). The Belgian politician was debating the future of the European Union at an event in Brussels. Joining him in the debate were former French president Valéry Giscard d’Estaing, former Spanish Prime Minister Felipe González and former President of the European Commission Jacques Delors. “Our problems are not institutional; we can do plenty within [the remit of] the existing treaties,” he said. The Lisbon Treaty, that went into force in 2009, stipulates that the next European Commission president will be chosen “taking into account the results of the European elections”. Several European parties are in the process of designating candidates to lead their EU election campaigns and thus run for the Commission presidency. Putting ‘faces’ on EU politics is aimed at stoking public interest in the upcoming elections, the first to be held since the 2009 Lisbon Treaty. The idea could also tackle the EU’s another European election issue; turnout has been falling since the first direct elections of the European Parliament in 1979. In a recent poll, 55% of Europeans said they would be more inclined to vote if they had a say in who would become the next Commission head. Giving his predictions for the upcoming May 2014 elections at the conference, Van Rompuy warned of a surge in eurosceptic votes. “There will always be a grand majority in Parliament to move Europe forwards, but they will face a much more difficult time than before,” the European Council president said. Pro-European politicians should stick their necks out, he said. “We don’t defend the results of the European Union anymore. If the people campaigning [for EU Parliament seats] are really the people who want to fight for the European Union, then it will work. If not, I’m scared of the outcome,” he said. Analysts have debated the possible impact of rising euroscepticism on the next Parliament’s make-up. “We have seen such eurosceptic pressures popping up in past European election campaigns as well – and they never quite met the expectations,” Isabell Hoffmann of the Bertelsmann Stiftung said in an earlier interview with EURACTIV. Anti-European themes are likely to be a feature of the upcoming election campaigns, with trust in the European Union is at an all time low, according to a eurobarometer survey from July. The European elections will be held in all EU countries in May 2014. It will be the eighth European Parliament contest since the first direct elections in 1979. The Lisbon Treaty states that the European Parliament shall elect the Commission president on the basis of a proposal made by the European Council, taking into account the European elections (Article 17, Paragraph 7 of the TEU). This will apply for the first time in the 2014 elections. EU affairs pundits and European parties have pushed for these parties to nominate their frontrunners in the election campaigns. This would make the European elections a de facto race for the Commission president seat, would politicise the campaigns and could increase voter turnout, they say. European Council president Herman Van Rompuy has expressed his objections to this approach in the past, arguing it could be counterproductive for the EU institutions' work. It is freightning to read that the EU can go on while the Eurosceptics will not be an overwelming power. But how about the basis of democracy: take into accound the opiniom of the minority. So the opinion of a large majority can be neglected? And the EU has already such a democratic deficit in its institutions. Sorry Mr Van Rompuy, but in Great Britain there is a massive growing trend of euroscepticism, towards the withdrawal of our membership from the EU. People are angry the EU do not sign off their accounts and that the leaders of the EU commission are unelected. We are angry about the amount of EU migrants coming into our country claiming benefits who have not paid into the system. Nigel Farage is becoming a rising star in the UK, and is the leader of one of the fastest growing political parties in the UK. I like many other people will be voting for ‘UKIP’ in the European elections. You said it again ? Why “scorning direct election of Commission president” now! FEAR? Seems…! As in your Statement you even won’t an “United Europe”! You’re fucked! Game Over ! Go to your retirement! That’s normal because NO one constitutional community concerning the economy has been created in the behalf of every selfish-interested member-states leaders ! See Merkel’s anti euro-bonds and southern-states high depth interests rates which causes high unemployment! United or Full Divided or going further hitting the wall! It has to say that leaders take their pen and bravely change the Lisbon treaty to an Constitution with real Democracy and equality between member-states ! Some won’t like this but i find this is a much better path than the Lisbon treaty or a rejection in referendum as it was in the past! So European citizens could really be involved to democratically elections with a so called People’s President ! Van Rompuy , you’re outdated! Rompuy is probably right, but who is going to believe him? People must be allowed to make their own mistakes before they can feel they’re part of the whole process. Personally I think candidates should be made to slug it out in a public arena with trident , net and hatchet, wearing nothing but togas. The whole show should be televised as a Big Brother event. Yep ! For Scotland leaving The UKSR as well!